Home Marijuana News What Is The Difference Between Medical And Recreational Cannabis? 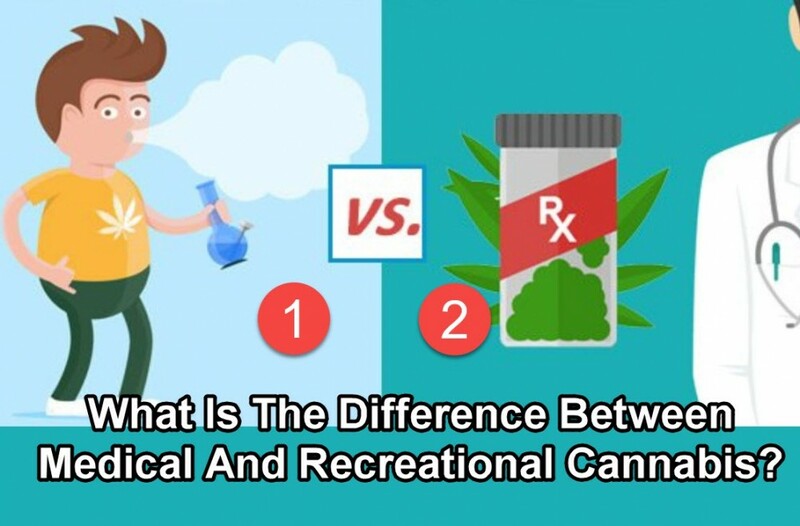 With more states legalizing recreational cannabis, you’re probably wondering about the many differences between recreational and medical cannabis. Both medical and recreational cannabis have overlapping similarities as well as their own differences. This guide will come in handy for anyone considering to use one or the other, and will provide you with information on what to expect with each. Cannabis is basically an unprocessed plant that has been used since ancient times for treating hundreds of ailments. At the time of writing, the Food and Drug Administration (FDA) still does not recognize cannabis as medicine and it remains a Schedule 1 substance, which means that it has addictive properties and no therapeutic value according to federal law. But science tells us otherwise, because the cannabis plant has hundreds of compounds called cannabinoids, which have significant health benefits. Two of the most well-known and widely-studied cannabinoids are: tetrahydrocannabinol (THC), the compound that produces a high, and cannabidiol (CBD), a therapeutic compound which has no psychoactive effects. The current legal marijuana marketplace today is filled with hundreds of different products that contain varying amounts of THC and CBD for both medical and recreational use. Recreational cannabis refers to its consumption purely for social or leisure purposes; one with no medical reason. On the other hand, medical cannabis is used to treat an ailment, whether it’s stress, insomnia, anxiety, or cancer. Most recreational users are after the delightful buzz brought about by THC, which is why they go after high-THC products or strains. And while generally speaking many medical patients prefer high-CBD products because they don’t produce a high, some patients use cannabis products high in THC because this cannabinoid also has its own important medicinal benefits. Medical marijuana (MMJ) recommendations are needed for medical marijuana: You need to be diagnosed with a qualifying condition to obtain an MMJ recommendation, which should be renewed on a regular basis. The vast majority of US states have only legalized cannabis for medical use, so anyone who lives in these states will need an MMJ recommendation. You will also need to be at least 18 years of age to purchase medical cannabis but there are a few cases where individuals below 18 will be granted an MMJ card. The rules vary from state to state. No recommendations needed for recreational marijuana: As long as you’re an adult, you can walk into any dispensary and purchase the cannabis you need in the amount that is allowed by your state. You don’t need to show a card or recommendation. You will need to be at least 21 years of age to purchase recreational cannabis from dispensaries. Each state has their own rules regarding the maximum allowable amount of cannabis that medical and recreational cannabis users can purchase, grow, and own. 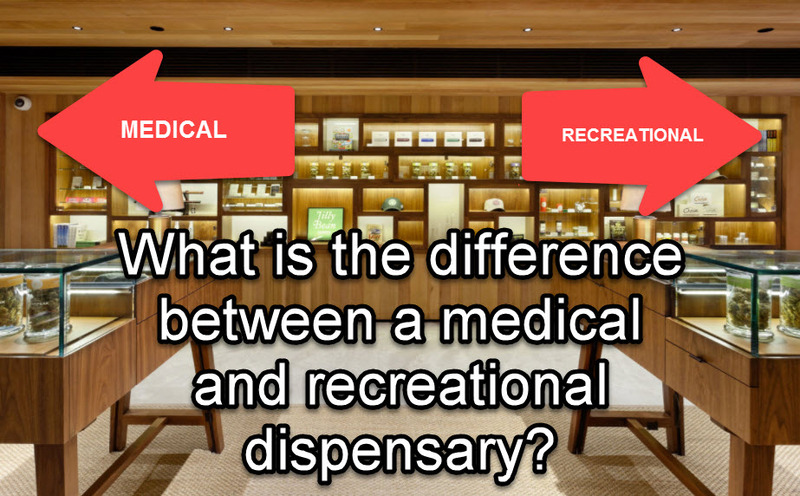 Medical and recreational dispensaries offer similar shopping experiences, and it’s also common to find a dispensary that caters to both kinds of customers (these are known as dual-licensed shops). MMJ patients will be asked to present their card plus an ID as proof that they can legally purchase their medicine. Sometimes, medical dispensaries are equipped with waiting rooms so that patients are guaranteed privacy. Medical patients may also be granted tax breaks and discounts. If you are an MMJ patient, medical dispensaries are your best bet for finding out information on cannabis and its benefits for your specific ailment. Feel free to talk to budtenders and check out several dispensaries until you find one whose staff, services, and products satisfy your needs. When it comes to product selection, there isn’t much of a difference between the two kinds of dispensaries. Shelves of both medical and recreational dispensaries are usually filled with various cannabis flower strains, edibles, beverages, topicals, concentrates, and vaporizers. Additionally, medical patients may have other perks aside from tax breaks and discounts: these include higher THC limits and higher quantity restrictions. Whether you have an ailment or not, there is a benefit to using cannabis. You can use it to improve your wellness in general, or use it as a natural form of stress relief. Remember, you don’t have to be sick in order to reap the benefits of cannabis. It’s also healthier and safer than drinking alcohol. Understanding the difference between medical and recreational cannabis can help you better navigate the dynamics of the industry as well as the changing laws, and see how they apply to you. MEDICAL OR RECREATIONAL DISPENSARY, HOW ARE THEY DIFFERENT, CLICK HERE. 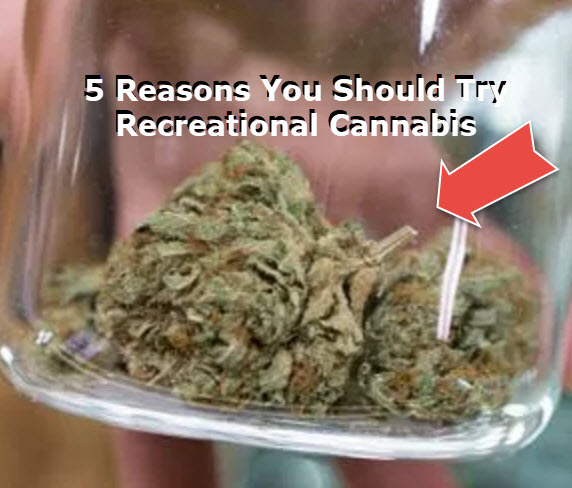 REASONS TO TRY RECREATIONAL CANNABIS, READ THIS. Between, Cannabis, Difference, Medical, Recreational. Bookmark.